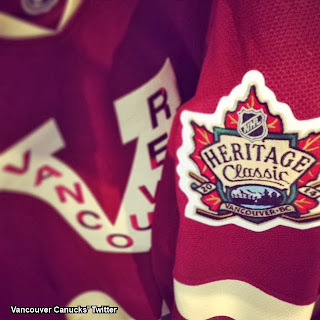 The Ottawa Senators will be the road team for the 2014 Heritage Classic, but they owned the Heritage Classic jersey reveal. A press conference in Ottawa was the setting for the reveal. The sweaters weren’t necessarily surprising or new, but they were the right choice by both teams. The Senators built up to this reveal by posting teaser images of pieces of the jersey. It was working, right up until the full jersey was leaked a night before the presser. What the hockey world saw was a “vintage white” sweater with two broad stripes, one black and one red, running across the chest, back, and arms. The same two stripes also run along the Reebok curved hem. It is in fact, a light version of the Senators’ current third jersey, with a Heritage Classic patch on the front-right of the jersey. The Vancouver Canucks provided the surprise of the day, as Henrik Sedin was present to showcase the Canucks’ sweaters. 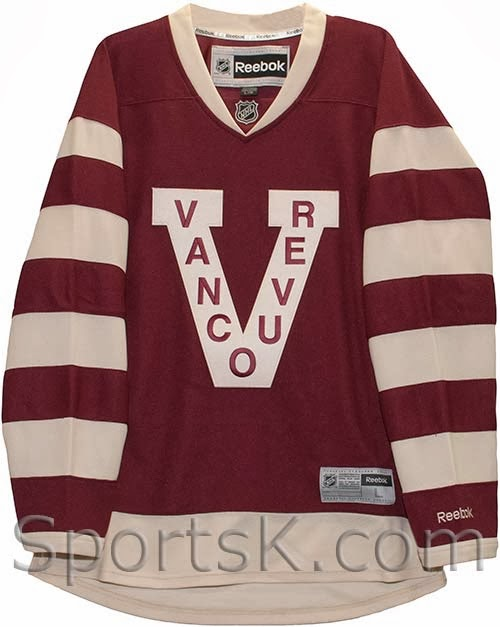 Vancouver will be using the Millionaires sweaters they wore for one game last season. Surprisingly, no changes were made to this sweater other than the expected addition of the Heritage Classic event patch on the right shoulder. I say it’s a surprise because the NHL typically subscribes to the theory that there has to be something “new” about retro inspired jerseys for the public to want to buy them. The Sens’ jersey works perfectly for this heritage inspired game. Complementing the Senators on anything is tough for this Leafs fan to do, so it must mean they did something pretty good. If you asked any jersey nerd to design an outdoor game sweater for Ottawa, this is what they would come up with. I tip my cap to everyone involved in the final decision on this jersey for not falling into the trap. It’s a trap of giving the people what they ask for, but then feeling the need to add something “new” or “different” just to put your mark on it. The sweater is what the people asked for and I hope the people rewards the designers by purchasing this thing. I can’t purchase it because it’s against personal policy to have a Senators and Canadiens sweater in my collection. The Canucks sweater is also perfect for the Heritage Classic. It seemed as if the icing on the cake, when acquiring the Millionaires brand, was to use it for one of these games. Now here it is! The Canucks should also be complimented on not falling into the same trap mentioned previously. I was certain that something was going to change on the jersey from the last time we saw them, in March 2013, to the time they skated on to the ice at BC Place. I really thought that collar laces would be added or they would go as far as giving us a blue version of this jersey. I definitely prefer it this way though. The 2014 Heritage Classic will look great. Plus, the teams are able to reference that this game is inspired by the 1915 Stanley Cup Final! I may even go as far as to say that this is the best looking outdoor NHL game to date! 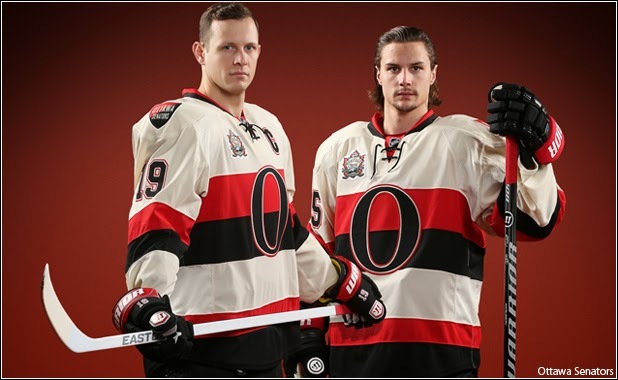 I always had my doubts about a light version of the Senators heritage jerseys, but wow do they look fantastic.